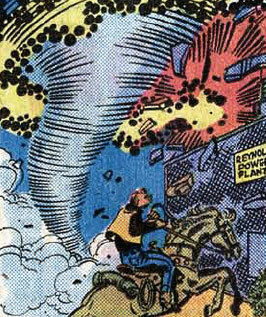 Powers/Abilities: The Texas Twister is an expert horse rider, lasso thrower, and sharpshooter. The powerful winds mixed with the radioactive material from the waste site and radiation from the power plant, caused Daniels to be infused with radioactive air molecules, giving him the ability to generate tornadoes at will. He can use his powers to propel him into the air, giving him the ability to fly or hover. His skin is denser than normal and prevents unwanted heat loss from wind-chill factor. His skin is harder than human and resists friction and airborne particle abrasion. (Fantastic Four I#177 (fb) ) - Drew Daniels was rounding up stray cattle near the Reynolds Power Plant when a tornado touched down near the site's waste storage area. Daniels found himself in the path of the raging tornado and was soon swept up into it as it hit the power plant. Daniels was overcome by the nuclear winds and instinctively tried to escape and found that he was able to generate a tornado around himself and fly out of the nuclear tornado. Daniels decided to test his new found powers out by halting the nuclear tornado from doing any further damage and easily dissipated the storm. Now that he had powers, Daniel decided he was going to make something of himself instead of being a cattle handler, and headed East to New York City to make his mark on the world. (Fantastic Four I#177 (fb) - BTS) - When the Frightful Four placed an ad in the local paper for an opening on the team (see Frightful Four Wannabes), the Texas Twister decided to check out what they had to offer. (Fantastic Four I#177) - After displaying his powers to the Frightful Four, the Texas Twister decided to turn down the offer to join, stating he had a better offer elsewhere. (Captain America I#217) - When the criminal Corporation began gathering super-powered individuals, Nick Fury decided to create SHIELD's own group of super agents. Still looking for a place to make his mark on the world, Texas Twister joined Fury's team. After showing what they were capable of doing, the Falcon decided to help train the group. (Fantastic Four I#192) - When the Fantastic Four disbanded for a short period of time, the Human Torch (Johnny Storm) entered a cross country car race. The Texas Twister took the opportunity to scout out the Human Torch, while putting on a show for the audience by testing the Human Torch's powers. As a crowd gathered, the Texas Twister used the opportunity to leave, telling the Human Torch that he could see why his employers were interested in him. (Captain America I#228) - The Texas Twister was training with the other SHIELD Super-Agents when Captain America called looking for the Falcon (Sam Wilson). The Falcon had not been around to help with the training for days and the Vamp mentioned they were doing just fine without him. (Captain America I#229) - When Captain America figured out that one of the Super-Agents was a spy for the Corporation, he attacked the group to find out who was the traitor. During the battle, it was discovered that Blue Streak was a traitor and as he was being violently interrogated by the Vamp (secretly another Corporation traitor, she was trying to kill Blue Streak to prevent him from revealing her involvement), the Texas Twister decided that the group was all crazy and quit. (Incredible Hulk II#265) - When the Corruptor forced Rick Jones to send a distress signal to the Avengers to lure them into a trap, the signal was unable to reach New York due to the mountain range, but instead was received by the Rangers. The Rangers discovered that the Corruptor had the Hulk under his powers and was unable to overpower the gamma-powered persona of Bruce Banner. Rick Jones managed to calm the Hulk down, allowing him to revert back to Bruce Banner. Without the aid of the Hulk, the Corruptor's plans were thwarted and he was easily captured. The Rangers decided to remain together. (Marvel Super Hero Contest of Champions#1, 2-3 - BTS) - While performing at a local rodeo show, the Texas Twister was enveloped in a glowing red energy field and teleported to a vast arena along with virtually every other other super-powered hero from every nation on Earth. They would soon learn that the cosmic gamesman known as Grandmaster and Death were playing a game of life and death, and the heroes where chosen to be the pawns in the game. The Texas Twister watched helplessly as each side chose twelve heroes to use as pawns. As one of the many not chosen to be used, Texas Twister and the others remain behind in the arena and only watch. After the game was over, all the heroes were placed back where they were teleported from, finding that only an hour had elapsed. (Incredible Hulk II#279) - When the city of New York honored the Hulk for his heroic acts, the Texas Twister along with the rest of the Rangers were there to show their support. (Spider-Man: Chaos in Calgary#4) - Shortly afterwards, the Texas Twister and his fellow Rangers Shooting Star and Phantom Rider (Hamilton Slade) were working at a rodeo in Canada when it was attacked by the Frightful Four. Spider-Man (Peter Parker) happened to be there to assist the trio, Turbine and the Right Riders in stopping the newly formed group. (Solo Avengers#18 (fb)) - When his powers began to fade, Texas Twister started to fear that he would lose his act and that Shooting Star would leave him. The demon Riglevio approached him and promised to give Twister his powers back for a price, and Twister agreed, not knowing what the price was. With his powers restored, Texas Twister had a fantastic week, then the demon showed up to collect Twister's soul. Twister begged for release, asking the demon to take anyone else, and the demon did, merging his form with the form of Shooting Star. (Solo Avengers#18 (fb) - BTS) - Riglevio put a spell on Twister so that he couldn't speak of the demon's possessing Star to anyone. Over the following months, he continued participating on missions with the Rangers, unable to do anything about the demon in Star's body. He started searching for a way to free her. (West Coast Avengers II#8) - When Riglevio took the form of Shooting Star, it was able to mentally take control over the Rangers, with the exception of Firebird, who was immune. As the Rangers met with the West Coast Avengers, Firebird discovered the true identity of Shooting Star, which led to a battle between the two groups. As the West Coast Avengers defeated the demonic Shooting Star, the hold it had on the Texas Twister and other Rangers subsided. They learned that the demon worked for Master Pandemonium. (West Coast Avengers II#9 (fb) ) - While discussing what the plans would be to find out the truth behind Master Pandemonium's involvement, Hawkeye asked if the Rangers would let the West Coast Avengers take care of it. Texas Twister was part of the group that agreed to let them handle it. (West Coast Avengers II#31 (fb) - BTS) - Texas Twister spent the following months in the Phantom Rider's cave, living and squalor and seeking ways to contact the demons, either to get Shooting Star back or to get revenge. (West Coast Avengers II#31) - Phantom Rider checked in with Texas Twister, who was sitting before a flaming brazier, and admonished him to speed his revenge. They performed a mystic rite to summon a demon, and pulled forth Arkon, of other-dimensional Polemachus. Arkon rushed out, seeking to attack the Avengers. (Solo Avengers#18 (fb) - BTS) - Texas Twister learned from an occult book that he'd never been losing his powers in the first place and that he'd only been tricked by the demon. He discovered that his best way to get Shooting Star back was to confront the demon Riglevio. (Solo Avengers#18) - Texas Twister traveled to the West Coast Avengers' headquarters (where the demon Riglevio was imprisoned), seeking out the demon that had possessed Shooting Star. He asked Hawkeye for aid, but when Hawkeye recommended that Texas Twister get some rest first, Twister used his powers to force Hawkeye to show him the demon. Twister convinced Hawkeye to let him into the cage with the demon, and Twister embraced the demon, kissing it on the lips and confessing his love. The demon shifted back into Shooting Star's form, then Twister finally explained to Hawkeye how Starr had been possessed. The demon then revealed that he'd possessed Texas Twister's form and started tearing things apart with his winds. He repelled some of Hawkeye's arrows, then got knocked to the ground by a bola arrow, and pinned to a tree by others. When Hawkeye threatened to kill the demon, he knew the hero wouldn't do it, but Shooting Star forced the demon to possess a nearby statue, and Texas Twister was finally freed and reunited with Shooting Star. 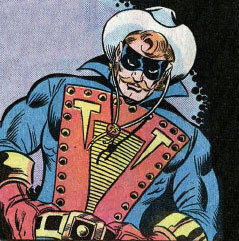 (Thunderbolts I#57-58) - Texas Twister, along with the rest of the Rangers, were among the many heroes suspended above the Earth by Graviton during his attempt to take over the world. Graviton was eventually defeated by the Thunderbolts and the heroes were lowered to the ground. (She-Hulk II#1 (fb) ) - Texas Twister fought Southpaw in Texas. (Civil War Files (fb) - BTS) - After celebrating one night too hard, the Texas Twister ended up getting drunk and causing damage to public property. In order to work off his sentence, he agreed to join the Thunderbolts Army and registered with the Superhuman Registration Act in the process. (Thunderbolts II#107) - In order to deal with the threat of thousands of civilians being empowered by Grandmaster and the Wellspring of Power, the Thunderbolts Army was split up into various squads. Texas Twister was placed on the Beta Squad as its leader and covered the Los Angeles area. When Bloodstrike and Smiling Tiger turned on their squad, Texas Twister realized that they received their powers from the Wellspring itself and were now a liability to the squad's mission, however the core group of Thunderbolts managed to stop Grandmaster's plans. (Civil War#7) - In the aftermath of the civil war between heroes, Iron Man (Anthony Stark) started the Fifty States Initiative, and the Texas Twister joined his fellow Rangers to cover the Texas area. Yellowjacket introduced them to the media. (Avengers: The Initiative#1) - Texas Twister was present at Camp Hammond when a group of new trainees arrived. (Avengers: The Initiative#2) - The Texas Twister was part of the Initiative group to stop an attack by HYDRA. Note: It is possible that the Texas Twister was an agent of SHIELD from the very beginning. Before being shown as a SHIELD Super-Agent he mentions "other group" (FF I#177) and "employers" (FF I#192), which could mean he was scouting the Human Torch for SHIELD all along. Also a tailor would not be able to make a costume to withstand the powerful winds that he generates with his powers, something that SHIELD would be able to provide. The scouting in Fantastic Four I#192 had to be for SHIELD because that issue was published after Captain America I#217, which showed Texas Twister as a SHIELD Super-Agent for the first time. Texas Twister and Shooting Star appear in a story in Marvel Super-Heroes III#15. However, the story is REALLY goofy and reunites the lost Shooting Star with Twister after her demonic possession ...ignoring the fact that this had already been done in Solo Avengers#18. It was apparently based on work by an unidentified penciler that Rick Parker found, inked, and scripted. It included a Hellstorm doppelganger named Heckstorm and two god-like soothsayers named Unidapus and Igodapus ("You need a puss" and "I got a puss"). Texas Twister has entries in the Official Handbook of the Marvel Universe I#11, OHotMU Deluxe Edition#13, the OHotMU Master Edition, All-New OHotMU Update#4 and has a partial entry in Civil War Files as one of the Thunderbolts army. Thanks to eagle-eyed Markus Raymond for adding She-Hulk II#1.